St Marie-Marguerite was born the eldest daughter of a very poor family near Quebec, Canada. Her education was short and limited. She married a travelling salesman at 19yrs. She had six children but by the age of 30, her father, husband and four of her children had died. 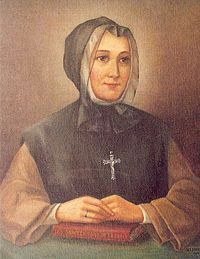 When her two remaining sons joined the priesthood, St Marie-Marguerite also sought a more spiritually fulfilling life. St Marguerite founded an association of women to care for Quebec’s poor; it became a lifeline for many hundreds of unwanted and uncared for city residents. Pope St John Paul II, who presided at St Marguerite’s canonization said, “In all these sufferings Marguerite grew in her belief of God’s presence in her life and of His tender love for every human person. She, in turn, wanted to make known His compassionate love to all”. The work of St Marguerite’s association was extended to the poor in many other cities; the association members became known as the “Grey Nuns,” because of their chosen clothing. St Marguerite’s Feast Day is 11th April, 16th October (Canada). She is the Patron Saint of widows, difficult marriages and the death of young children. Pray for us that we will give freely of our time to others but especially to the poor and marginalised.